Triggerfish: One of the most dangerous fishes in the ocean that you’ve never heard of. If you’re going scuba diving, there’s a good chance you’ll see some sharks. For most divers like myself, that’s something really exciting and to be honest I get a bit disappointed if I don’t see any. I won’t pretend my heart doesn’t beat a bit faster when I see that distinctive fin and see how powerfully they move in the water. But in all honesty, it’s triggerfish that concern me more than sharks when I’m diving. Triggerfish come in all kinds of colours and sizes but all triggerfish share a few common characteristics. These include a compressed oval body-shape and small eyes set far back from the mouth. The mouth is small but they have a very powerful jaw. Strong enough, in fact, to be able to crush shells and crustaceans. 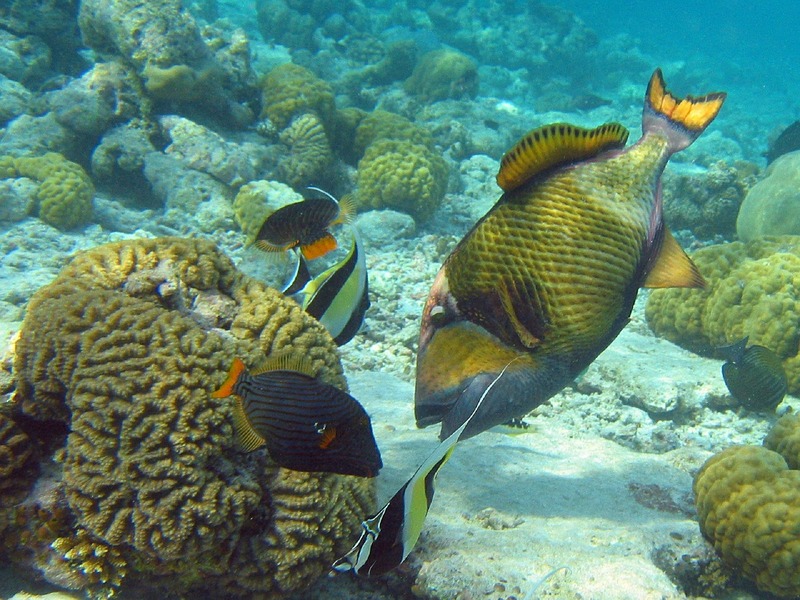 While Picasso triggerfish only grow up to 30cm in size, titan triggerfish can grow up to 75cm/30 inches, and so a bite from a titan triggerfish can cause more damage. They are most aggressive during nesting season, but attacks aren’t only limited to this period. Wait, I’m not here to try to scare you about triggerfish! I’m fighting in the shark corner, and trying to explain why there are other species that get fewer headlines but are more of a concern. It’s good to put concerns into context, plus it doesn’t hurt to be clued up on potential marine hazards so you know how to deal with problems if they arise. The first time I was attacked was when I snorkelling in the Maldives. I was blissfully unaware of any problems until I suddenly felt a sharp, deep bite on the end of my finger. “Shark!” I thought to myself. Then turned around to see a pretty little blue, yellow and white fish looking at me. I could hardly believe it was the perpetrator, but I recognised it as a Picasso Triggerfish (I see where the name ‘Picasso’ triggerfish comes from: it looks like the colours are splashed across them like a piece of modern art). The second time I was attacked by a triggerfish was while I scuba diving with my then-scuba instructor boyfriend, when a Titan Triggerfish started chasing me. He pulled off a fin to bat the fish away and gestured to me to move away, then it started trying to attack him for several minutes until we managed to get away by swimming backwards whilst facing it and kicking our fins at it. I've had a few more run-ins with triggerfish since then too, which has left me with a healthy degree of respect and caution. Typical indications that a triggerfish is getting upset with you is that it holds its first dorsal spine erect or possibly rolls onto its side to take a better look at you. The best thing to do if you come across and agitated triggerfish or get attacked by one is to kick it away with your fins and try to move horizontally as far away from that area as you can because triggerfish are very territorial (particularly, although not exclusively, during nesting season). However, they never stray far from the nest site, no matter how narked they are. Their territory is a cone-shaped area stretching all the way from the seafloor up to the surface, so trying to escape to the surface is not a good idea (and let's face it, it’s never a good idea anyway if you’re scuba diving!!). I was lucky that the ones that attacked me weren’t too big but Titan triggerfish can grow up to 30 inches in length (and almost that in width) which is why they give me the heebie-jeebies. That and their creepy eyes, which have independently-rotating eye sockets! However, it’s worth noting that sometimes they will just charge aggressively and not actually take a chunk out of you. 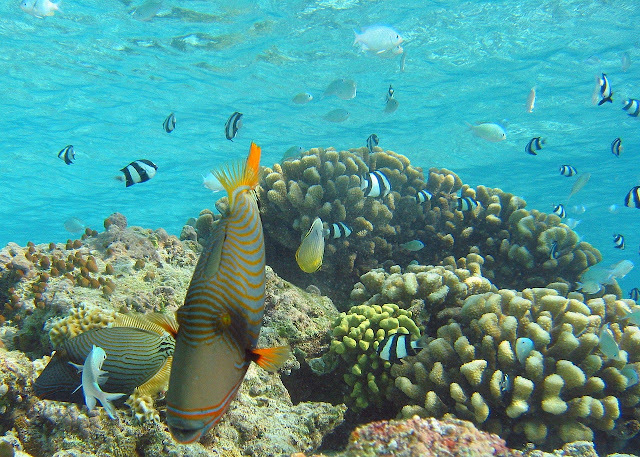 And some of them do look very nice (just maybe not the Titan Triggerfish!). Titan triggerfish are much less attractive than the other varieties, and they are best identified by their yellow face, fins and body set against a background of blue-grey, with a blue-grey throat and prominent eye area. Triggerfish varieties have all kinds of colours and patterns, including the red-toothed triggerfish (which is deep blue with a scarlet mouth) and the beautifully-patterned orange-lined triggerfish. The fact they vary so much in appearance can make it a bit hard to separate them from just a normal reef fish. The Picasso triggerfish is another a very eye-catching variety (see the third pic in this article). If you’ve never seen one before you’ll know it when you see it - they seem as though they were decorated by the great Spanish artist himself, with bold flashes of turquoise and yellow contrasting with muted tones of brown, black and grey. 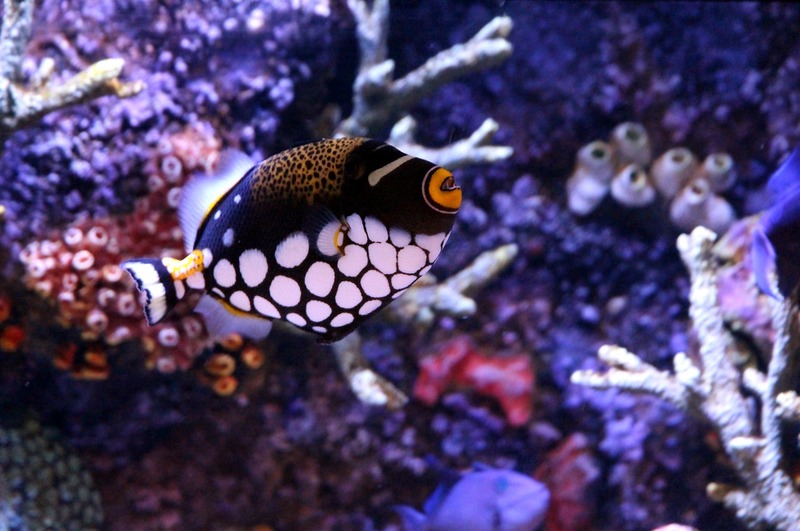 Another striking variety is the clown triggerfish (not to be confused with the cute orange clownfish from ‘Finding Nemo’. 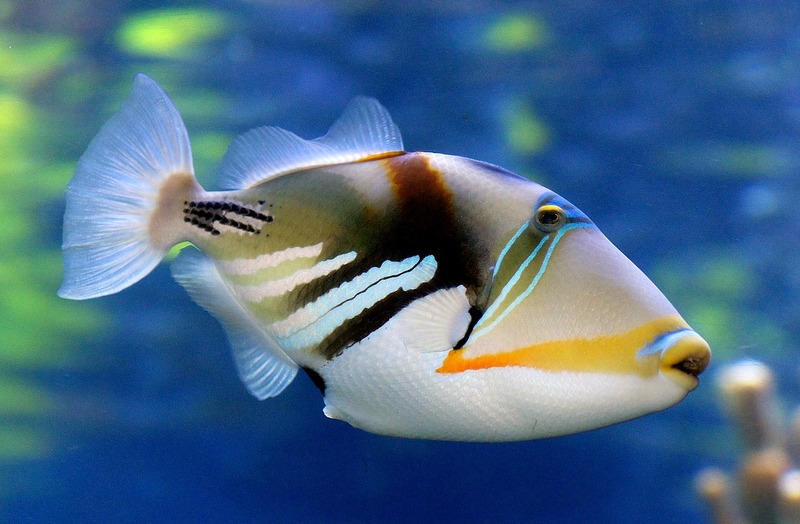 As with the Picasso triggerfish, it’s pretty clear to see how they got their name. With bands of yellow and white around a clown-like mouth; large round spots on the belly and leopard-like spots around the first dorsal fin, this fish certainly is the most amusing-looking fish of its family. Yellow-spotted triggerfish go by several alternative names including blue triggerfish, rippled triggerfish or blue-and-gold triggerfish. If there were an inappropriate juvenile beauty pageant for triggerfish, juvenile yellow-spotted triggerfish would probably be the winner. 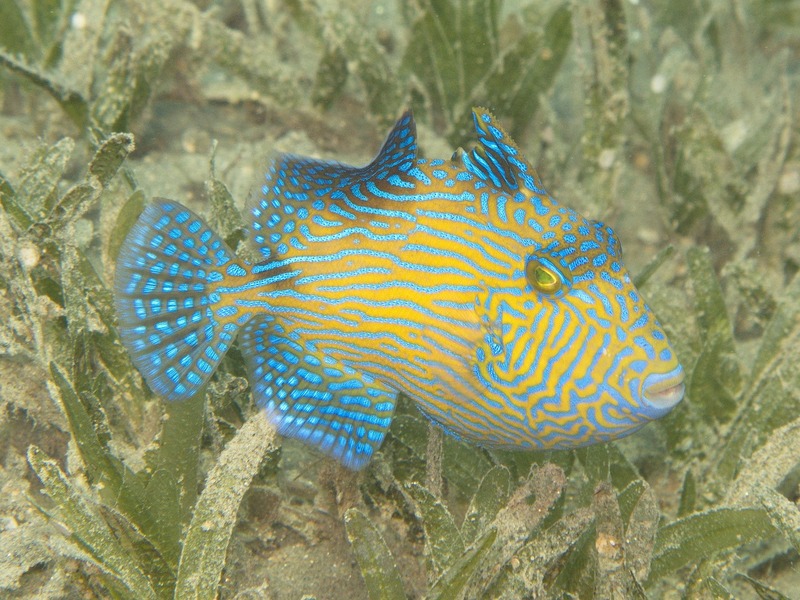 The juveniles are a yellow-gold colour with a beautiful pattern of bright blue lines running across them, and electric blue fins. These lines merge as they grow older, resulting in adults with a predominantly blue appearance. 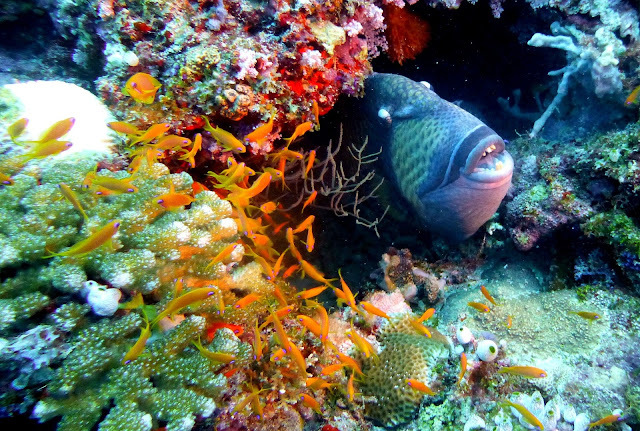 Triggerfish are carnivorous bottom-dwellers which prey on things like worms, crabs, crustaceans, small fish and even sea urchins (which they flip over in order to attack their bellies which are covered in fewer spines). When attacking prey, they flap their fins and squirt water from their mouths to waft away debris. Although triggerfish are largely solitary creatures they come together at traditional mating sites at certain times. The males prepare nests on the seafloor where the females lay thousands of eggs. Whilst the eggs are developing in the nests both sexes blow water on them at intervals in order to keep them well-supplied with oxygen. And finally, back to sharks! I’m not here to tell you there’s no risk at all from sharks (they are apex predators and you accept that when you venture into their territory) but if you look at the statistics, shark attacks are extremely rare, especially compared to triggerfish attacks. Especially when you think of the millions of people every day who swim, snorkel, dive, fish and wash in the oceans around the world every day. You’re actually statistically more likely to die from taking a selfie, being hit by a champagne cork or falling out of bed. Sharks are thought to kill about eight to 10 people per year. That’s less than hippos (500), snakes (50,000), other humans (475,000) and the number one killer in the animal kingdom, mosquitoes (725,000). And if you crunch the numbers on shark-related deaths, scuba divers are the least likely to be victims: 8% of shark-related deaths compared to surfers (51%) and swimmers or waders (38%). A marine biologist told me sharks can get confused occasionally by surfers because surfers look like turtles from below, but that divers are safer because they don’t spend much as time on the surface (sharks like to attack prey from beneath). She added that blowing bubbles is a sign of aggression amongst marine creatures, and since we have a constant stream of bubbles from our regulators, it makes us seem more badass. I've spoken to various other diving instructors and marine biologists about this too and they all reflected the same sentiments. A group of triggerfish is called a harem. This is because in some species, the males have been observed keeping a ‘harem’ of female mates. (Not much changes then). Triggerfish can rotate each of their eyeballs independently. Triggerfish take their name from the two sets of dorsal spines which have two purposes: The first set is to deter predators and to ‘lock’ themselves into holes and crevices. They then depress the smaller ‘trigger’ (spine) to ‘unlock’ themselves.